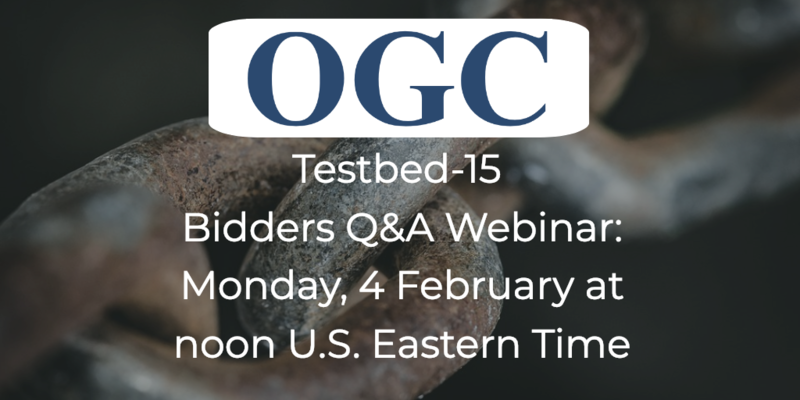 A Q&A Webinar for anyone interested in participating in OGC's Testbed-15 initiative has been scheduled for Monday 4th February 2019 @ noon EST. The OGC Testbed-15 Call for Participation was recently published and is available to download from the OGC Portal. Instructions on how to participate are in the Call for Participation, but OGC Members new to the process may have some questions on what 'participating' means, how cost sharing works, etc. As such, we will be holding a 'Bidders Q&A Webinar' where interested parties can ask any questions concerning Testbed-15. The webinar will be held on Monday 4th February 2019 at noon US Eastern Time. Registration is free but mandatory. Further information on Testbed-15 is available on the Testbed-15 page on OGC's website. If you are unable to attend the webinar, there is a plethora of information contained on the Testbed-15 web page. However, if you can't find the information that you're after, please feel free to contact Scott Serich, Director Innovation Programs, on techdesk [at] opengeospatial.org. Responses to the Call for Participation are due by 11th February, 2019.